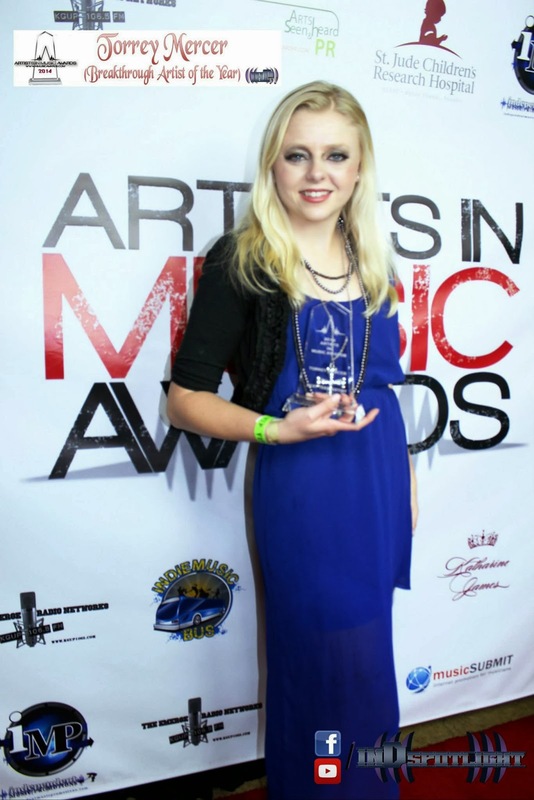 Award Winning Singer Songwriter and Anti-Bullying advocate, Torrey Mercer added two more awards to her resume including Best Teen Artist and Inspirational Artist of the Year at the 3rd Annual Artists In Music Awards held at Jon Lovitz Theatre in Hollywood, CA on Friday, February 7. LOS ANGELES, Calif. - Torrey Mercer is the reigning 2013 Indie Music Channel Award winner for Best Pop Song for her song “Looking Glass”. Torrey holds several nominations including Pop Artists Female and Pop Single for 'Looking Glass" at the 23rdAnnual Los Angeles Music Awards. On February 7, Torrey competed against 850 hopeful nominees, which was narrowed down to 150 on December 15 during the Nomination Event. On February 7, Torrey was awarded two trophies for Best Teen Artist and Inspirational Artist of the Year for her work in anti-bullying for kids during the 2014 Artists In Music Awards finale at Jon Lovtiz Theatre. Torrey performed with her full band at the legendary Jon Lovitz Theatre (formerly B.B. Kings) inside Universal Citywalk. Mercer appeared on the Red Carpet with Artist In Cinema recipient Christina DeRosa (Extreme Movie, Kings of Van Nuys), K.D. Aubert (Turning Point), Joe Torrey (The Power of Love), and Olden Polynice (Former NBA player for the Seattle Supersonics center). The award winning Torrey Mercer is an artist who strives to be brave, and to help her fans and followers become brave with her. Torrey wants to see the faces of her fans light up and smile, and that is her biggest mission as a recording artist. “To make other people happy.” Making her humble beginnings in musical theater, being cast as a leading role in over 30 musical theatre productions. Making her humble beginnings in musical theater, being cast as a leading role in over 30 musical theatre productions, Torrey always knew that she wanted to be onstage. She entered a variety of singing contests starting at age thirteen, winning first place in competitions such as the National Key Club Talent Competition, Del Mar TV Idol, Search for Talent, and more. Torrey has also sang for a variety of different major venues. She won "Best Inspirational Singer" in 2009 at Universal CityWalk in Hollywood in a competition called "Hollywood's Best New Talent", has sang the National Anthem for the National Football League for over 50,000 people, the US Tennis Open, Girl Scouts of America, and the San Diego Polo Fields, performed at the San Diego and Los Angeles House of Blues, the San Diego Convention Center, the San Diego County Fair, and a variety of other venues in both San Diego and Los Angeles. She has worked with a variety of different vocal coaches in both musical theatre and pop music training, including Dorian Holley, a former vocal coach of both Michael Jackson and American Idol vocal coach, David Coury, the voice coach of Leona Lewis and Ashley Tisdale, Leigh Scarritt for musical theatre and pop training, Roy Mote, Bob Marks, and more. But if someone were to ask Torrey what accomplishments she is most proud of, she would talk about something much different than all of that. In 2011 she was invited onto a National Anti-bullying tour, on both the East and the West Coast, where she got to perform at Boys and Girls Clubs, Summer Camps, and even Six Flags to talk to kids about ending bullying. Since the tour, Torrey has connected with schools in San Diego and talked to assemblies of children about the importance of speaking up and standing up for themselves when being bullied. Since the No Bully Tour, Torrey has become incredibly inspired, reaching out and working with charities such as the American Foundation for Suicide Prevention, the National Eating Disorder Association, Rady's Children's Hospital in San Diego, The Trevor Project, and Natural High. She created a charity music event for each of these charities, bringing them all together for a night of music in San Diego to raise money for their causes. She is also the proud holder of 2 Music Awards, a National Youth Arts award for her single, "Falling Again", and a 2013 Indie Music Channel Award for Best Pop Song for her song, "Looking Glass", which she wrote for anyone and everyone who has never believed in themselves. As of 2013, she has worked with a variety of schools putting on No Bully assemblies, working with thousands of kids all the way down the coast of California anywhere from ages K-8 at schools including, but not limited to Joshua Cowell School, Carmel Valley Middle School, Balboa Elementary, Rancho Del Rey Middle School, and more. Torrey is a firm believer in bullying being the cause of a variety of other issues, such as depression, self harming, suicide, eating disorders, low self esteem, and even abuse. She tries to reach out to kids of all ages on a regular basis in hopes that one day, she could change some of their lives, and help them on their road to recovery. Torrey has been singing since she was very young. She had bullies and peers shoot her down over and over again for wanting to pursue her dream of becoming a singer. But maybe that is what makes the work that she does to give back to others so special to her. Torrey wants to sing to send a message to her audience, to be there for her fans and ultimately, to make a difference. And after everything, she knows that this is her calling. Watch Torrey Mercer’s video “Looking Glass” on Youtube. It currently has over 47,000 views.